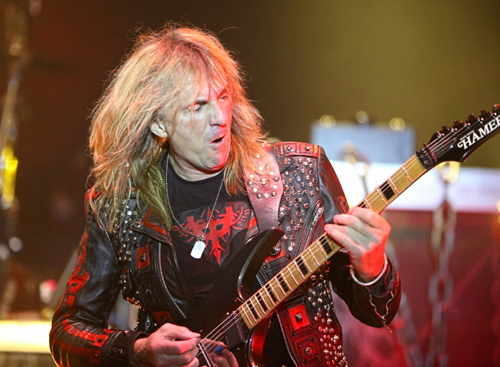 Parkinsons Disease has forced Judas Priest guitarist Glenn Tipton to step aside from the group. He was first diagnosed with early onset of the disease about a decade ago, but it has advanced to the point that it has compromised his ability to perform. The group issued a statement that read in part, "Right now Glenn is able to play and perform some of the Priest songs that are less challenging but due to the nature of Parkinsons progression he wants to let you all know that he won't be touring as such." Andy Sneap will fill his role in the band for the upcoming tour, but Tipton added to the group's announcement, "I don't rule out the chance to go on stage as and when I feel able to blast out some Priest! So at some point in the not too distant future I'm really looking forward to seeing all of our wonderful Metal maniacs once again." The group opnes it's North American tour on March 15 in Youngstown, Ohio.